Authors: Timothy R H Pearson, Sandra Brown, and Felipe M Casarim. The focus of land-use related efforts in developing countries to reduce carbon emissions has been on slowing deforestation, yet international agreements are to reduce emissions from both deforestation and forest degradation (REDD). The second ‘D’ is poorly understood and accounted for a number of technical and policy reasons. Here we introduce a complete accounting method for estimating emission factors from selective timber harvesting, a substantial form of forest degradation in many tropical developing countries. 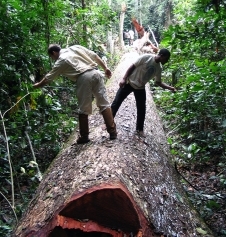 The method accounts separately for emissions from the extracted log, from incidental damage to the surrounding forest, and from logging infrastructure, and emissions are expressed as units of carbon per cubic meter of timber extracted to allow for simple application to timber harvesting statistics.